Modern Australia is an immigration nation, but a hundred years ago this wasn't the plan. The Commonwealth of Australia was built on a paradox. "The paradox was they were going to realise a utopia, but they were going to do it through excluding the vast majority of humanity". From 1901 this meant tough restrictions on immigration: The White Australia Policy. "We would be an exclusively white community. There would be no-one in Australia other than members of the white race. This was the objective." The consequences were devastating. "Had my sister and my brother been allowed to come to Bendigo, they wouldn't have died. They died because of a policy". This is the secret history of us. How modern, multicultural Australia was forged against the odds. 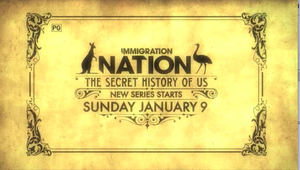 The story of how Australia became the immigration nation we live in today is a story that starts at Federation. It's a sunny Autumn day in May 1901 and half a million people cheer the future king of England, the Duke of York, as he makes his way to the Royal Exhibition Building in Melbourne. "You've got all this pageant and pomp and ceremony of dukes and the military and people waving streamers and grand arches. Here we all are at the beginning of something incredible". It is here that Australia's first federal parliament will be opened. The nations founders are about to be sworn in before a packed crowd of 12,000 dignitaries. But this is not simply a ceremony. Led by Australia's first Prime Minister Edmund Barton the architects of this brand new nation are designing a country unlike any other. "Australia would learn from the mistakes of other countries and create a society that was just so much better than the societies of Europe, England, United States". The foundations are already strong, in some states women have the vote and workers are protected by legislation guaranteeing fair pay and conditions. But Australia's leaders want to build on this and create a working man's paradise. Quite simply, the most progressive and democratic society the world has ever seen. "They see themselves as creating a brave new commonwealth in which equality will rule and in which they'll be at the forefront of democratic, social, industrial advance." "This whole federal apparatus is going to protect the social laboratory that Australia was, to create a kind of utopia." But the dream also masks a deeply held fear. The founders of the nation feel threatened. Ironically, this means the bold and noble plan is designed to safeguard democracy, equality and freedom for one race. This program is so absurd and mocking that I'm speechless. It is pure propaganda lies for the diversity ideology. To say that a homogeneous country is a utopian dream "unlike any other" is a ridiculous lie. Homogeneity is a historical norm. There is nothing "secret" about it. Diversity is the ahistorical utopian against-all-odds fantasy. And as if Japan was offended by our White Australia Policy. Utter nonsense. Here is a preview of episode 1, or watch here for a larger view. ... peace came to the Old Continent only after the triumph of ethnonationalism, after the peoples of Europe had sorted themselves out and each achieved its own home. Professor Jonathan Haidt, What Can Liberals Learn From Conservatives? ... liberals desperately need to read some conservative theory to understand that a world of freedom, mobility and diversity is a recipe for a world of chaos, anomie and social disillusion. File under: those who can make you believe absurdities can make you commit atrocities. Reporter asks ... "why not just give up?" Jared Taylor: is diversity a strength? Knock, knock. Who's there? ... Machete!